Sorry about your injury. My broken King Pin came doing nothing so the wheels just came off on my front foot and I one foot skated to the side lines. Now for me I had a bad bad chest bruise and it felt like cracked ribs yet it was only a badly bruised chest. It was definitely hard to sleep for a few weeks yet breathing was not impaired. If you are a Doctor Go to guy, GO. Otherwise check out the symptoms and make a decision on treatment. Broke mine first time I attempted speed skating in quads since my return. I planted my front wheels, got part way through my stride and it snapped above the jam nut which had loosened on me during the session. I fell forward in what felt like slow motion and my trucks/wheels went sailing down the floor behind me. Scary, but no injury. I crouched as best I could and went down on my right side. Sore for a couple days, but nothing bruised except my ego. Best of luck in healing up quick. wow! sorry about your kingpin and chest! I hear brusies actually hurt worse than a break, so you're probably lucky there. 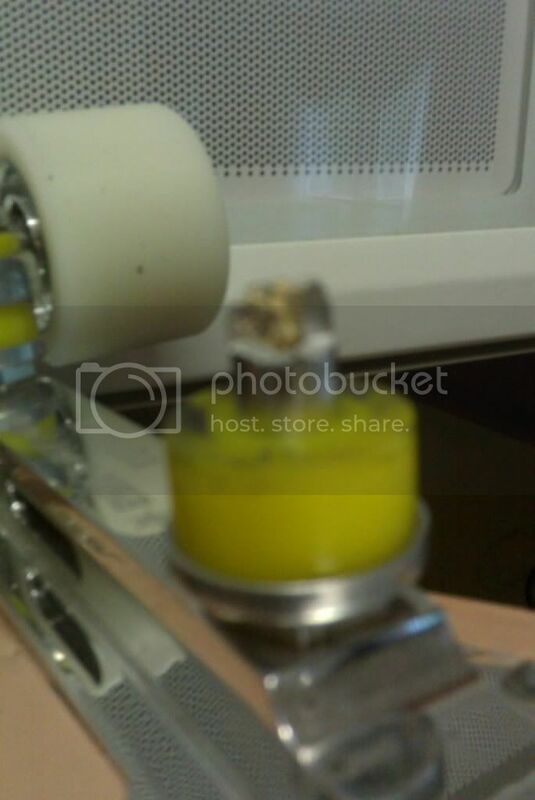 Kinda glad you posted about it, since my skates have been ticking me off for weeks, and I've been seriously wondering if I didn't BEND a kingpin, cause they suddenly pull really bad and I think it may be cause of kicking the wall. But not sure... I kept thinking "nah... couldn't be... that's not possible, is it?". Well if you can break one, I guess I might be able to bend one, huh. Take care and heal fast! My experiment last summer with high strength aluminum fully threaded stud kingpins on my Omega plate outdoor skates ended after breaking one for the second time. Each break was on the front truck, and going at fair speed. The amount of nylon ground off the plate with the instant friction against the asphalt that this kind of failure produces was significant. The instant braking action this produced was stunning for how fast it sent me right down to the ground. On the second fall I hit my outside chest and thought I might of cracked a rib, but in hindsight, it was more likely that I just tore something, since it healed up to fast for a bone break. However, for about ten days, when I sneezed, the pain level was beyond anything I have ever experienced. It literally felt like a sword was being stabbed straight through my whole torso. So good luck with your sore sternum and hope it does not interfere with your skating too much. Am I right in assuming the Prolines also use aluminum for the kingpins? If so, they fail with absolutely NO WARNING. They are fine one second and then just totally snap the next second. Steel and titanium will at least bend some first and give some warning before they finally break. Short of X Ray testing "Which would cost more than the Pins" there is really no way to visually inspect a Kingpin for internal fatigue. Cliffy shattered his Pro Line Kingpin near the micro adjuster not to long ago, fortunately he didn't suffer any injury from it, it's always the front Kingpin isn't it? Cliff & I both hope you heal quickly Craig & that this doesn't slow down your quest for Gold this year in Fort Wayne! After breaking a kingpin yesterday, I decided I wasn't going to put my skates on again until I inspected and/or replaced the three remaining. One of the three has visual cracks in it near the threads (same place as the other one that broke). I compared my new proline kingpins to my original proline kingpins and it looks to me that the lateral cuts through the threads go further down the kingpin on the new prolines. I'm sending them with Mr. Blair to the Tampa Classic so Curt can take a look at them. Good news is no broken or otherwise cracked ribs. Just lost about a square foot of skin and bruised up pretty bad. Wow Craig! Glad your ok. Come to the shop around 4 Monday and I will give you 4 new kingpins before Speed and Endurance practice. That way you have enough time to swap them all out. And if your not up to it, I will run it like last month. Call me Sunday. Did anyone notice I included my microwave in my picture? I did . Dude, glad you didn`t break anything. I`ve bruised a sternum before and it ain`t no joke (Yes, I used a double negative because I can lol). Hope ya get well soon. "My neighbors listen to good music whether they like it or not"
This break shows the weakness of this BAD DESIGN concept that uses a tapered head bolt to lock the adjuster nut by wedging up into the bottom of a split end kingpin. The process of drilling, tapping and splitting the lower end of the kingpin greatly weakens its ability to resist bending forces at that point. When the break starts right at the end of the slits, this is the weakest spot where the cross section area of kingpin metal has been reduced by all this really unnecessary machining there. Just give me plain old THIN NYLOCK nuts for my action adjusters, and leave my kingpins as SOLID METAL from end to end. I will soon be making new kingpins for my PowerTracs just to make sure this kind of a break does not happen to me. Once I know how fast I can make them, I may offer them to other concerned skaters. Email me if you are interested. You got that right! I will be posting some plates very soon as said green cloth! I just tossed my pro lines in the trash. My left front kingpin sheared off the plate, lost entire truck assembly during sprints. It was the hardest I ever fell, I pulled peroneus and tibial in both legs. Never broke any Roll Line parts. Wish I had my Navigator back. I'm sure someone would love to have bought them off ya. King pins...they break. All of them break. I'm not sure that I've ever seen one break like that tho. Usually at the lock/jam nut. Let us know what Kurt says.